Is there anything more warming than a Chinese steamboat with bubbling, fragrant broth, a kaleidoscope of condiments and fresh ingredients? "Mum would do a steamboat every Sunday night in winter when I was growing up in North Epping [Sydney]," says Kylie Kwong. "The electric wok would be placed in the middle of the table and all the family would gather around and get stuck in. "Sometimes we would have a steamboat on the Saturday nights my brothers and I went out clubbing. Mum would leave the wok on the table so when we returned home starving at 3am we could crank it up again and throw in some noodles. The broth only gets better as the night progresses and more things are dipped in it." 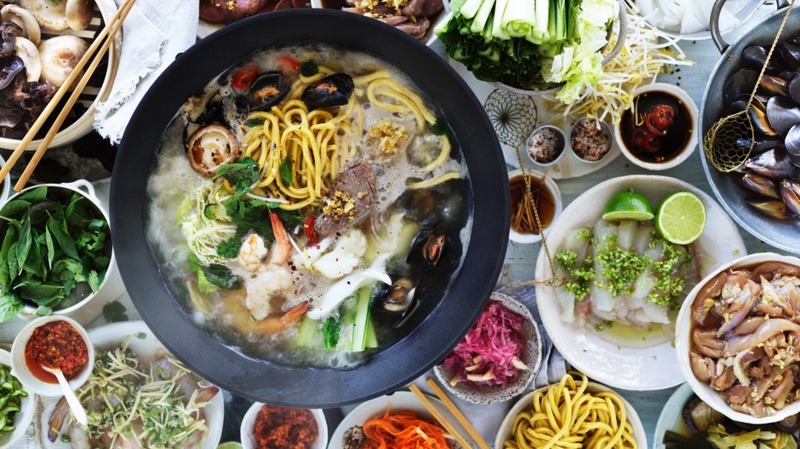 If you haven't experienced the magic, steamboat (also known as hotpot) is a Chinese cooking tradition whereby friends and family sit at a table and dip thinly sliced meats, seafood and vegetables into a boiling broth. Having lots of condiments is also key. "I just love it – the possibilities with steamboat ingredients are endless," says Kwong. "It's a blank canvas where you can paint a beautiful picture. Steamboats are really delicious in winter, for obvious reasons, but I still make them in summer. Australia has so much wonderful seafood and I go big on it." Kwong says she might use live scallops in the shell for a deluxe steamboat. "As soon as they hit the boiling stock, they snap open. It's very dramatic at a dinner party." Prepared ingredients are thinly sliced so they only need a few seconds' cooking time. Little steamboat baskets are used to chaperone raw items into the boiling stock, and can be bought from specialty Asian grocers. Chopsticks are also a valid form of dipping utensil. 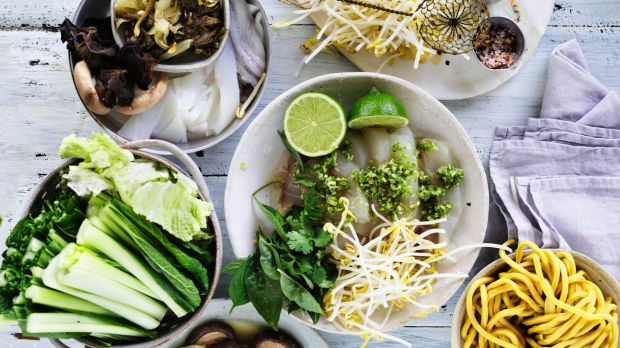 "We use the wire baskets when we have guests who haven't eaten this way before as it's a gentle way to introduce them to a steamboat," says Kwong. "When it's a family thing we get rid of the baskets and it becomes a chopstick free-for-all. It's just a great meal to break down barriers. Social, interactive and a lot of fun." You'll need an electric wok for this dish. If you don't have one, an electric frypan or a portable gas-burner will do the the trick – anything that will keep the stock boiling. There are lots of ingredients, and a fair bit of preparation beforehand but it all comes together quickly at the table for the most delicious spectacle. Raw ingredients can be prepped the day before. The flavours will actually be better after a night marinating in the fridge. Serve with steamed jasmine rice as a main meal. 1. Place pork, chicken, beef, fish and prawns in separate bowls, then set aside while you prepare the garlic and ginger paste. 2. Pound garlic, ginger and salt together with a pestle and mortar until you have a rough paste. Divide this paste between the pork, chicken and beef. 3. Add the marinade ingredients for the pork, chicken, beef, fish and prawns to their respective bowls. Thoroughly mix the contents of each bowl, then cover and refrigerate for 2 hours. 4. Scrub, debeard, rinse and drain the mussels; set aside. 5. Trim ends from the choy sum, then cut crossways into 3 pieces and wash thoroughly; drain. Discard outer leaves of the cabbage, then slice cabbage in half lengthways, remove core and cut crossways into about 4 pieces and wash thoroughly, pulling pieces apart to separate leaves. 6. Blanch Hokkien noodles in boiling salted water until al dente – about 4 minutes. Drain, refresh in cold water, then thoroughly drain again. 7. 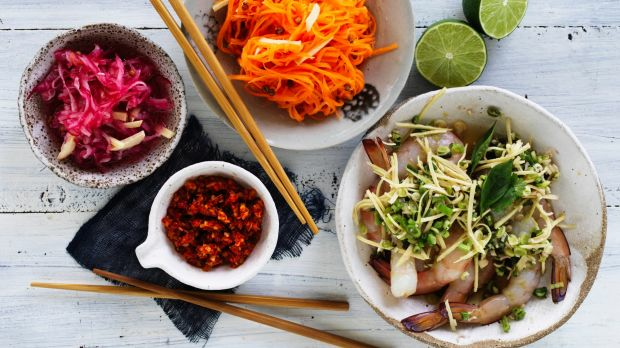 Arrange calamari/squid, mussels, choy sum, cabbage, bean sprouts, herbs, noodles and mushrooms in simple serving bowls. Place these on the table, along with the bowls of marinated meats and seafood. 8. About an hour before your guests are due to arrive, make the stock. Place the water in a large electric wok (or electric frypan) – about 35cm in diameter. Add all remaining stock ingredients and bring to the boil, simmer, uncovered, for 20 minutes. Turn off heat, cover and set aside. 9. Finally, arrange all the dipping sauces and condiments in small bowls on the table, allowing two bowls of each. 10. When everyone is ready to sit down and eat, place the electric wok in the centre of the table and plug in. Reheat the stock and invite your guests to choose their own meat, fish and vegetables to cook in the simmering stock, before dipping them in their favourite sauces and condiments. 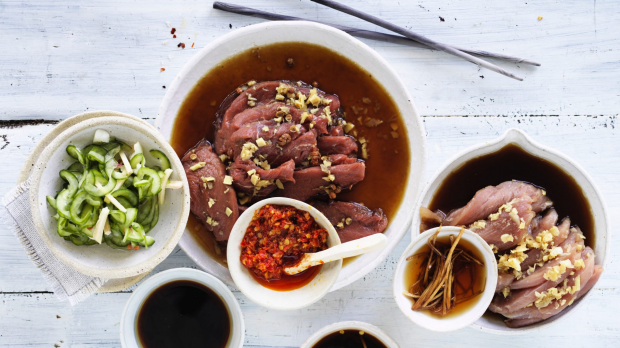 Use a wire basket or chopsticks to dip the marinated meat in the stock. Toward the end of the meal add the noodles to the rich, full-flavoured stock and divide among guests. 1. Soak mushrooms in hot tap water for 1 hour, ensuring that they are completely submerged. Use a small plate to weigh them down, if necessary. When softened, remove stems with scissors and discard. 2. Place mushrooms in a small saucepan and add enough water to cover. Add ginger, spring onion, garlic and wine or sherry, then bring to the boil. Reduce heat and simmer for 20 minutes or until the mushrooms are tender and infused with flavourings. Allow to cool in the cooking liquid then store the mushrooms, still in their liquid in the refrigerator until required – they will keep for a week. To use, drain the mushrooms well, squeezing out any excess liquid with your hands and add to the recipe as directed.